There are now many wearables, including fitness bands and smartwatches, on the market, but to me many fail on battery life, visibility, and price. The one that would match my requirements the best would be SMA-Q smartwatch, but in the meantime, I’m also interested in testing some more wearables at different price points. 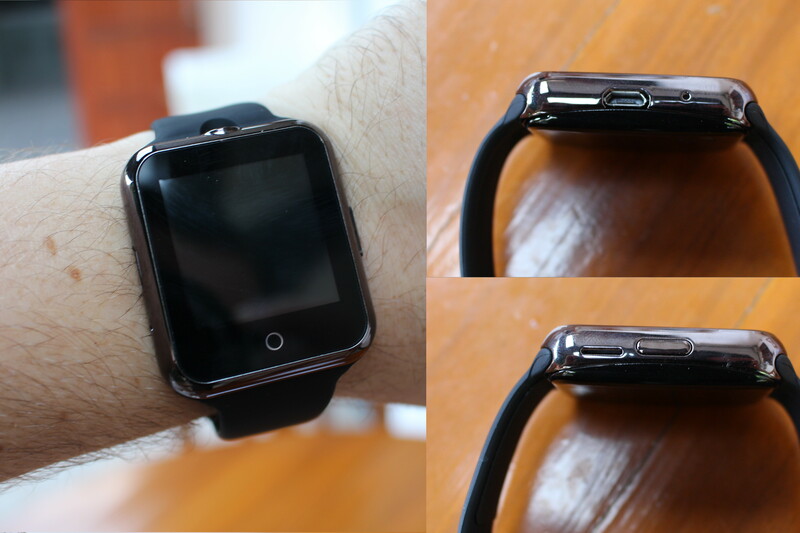 Tinydeal sent me NO.1 D3 smartwatch that sells for just $22.99 shipped. I’ll go first through the specifications, before checking of the watch more closely, and in a few days writing a review of the device. Battery – 350 mAh LiPo battery good for 36 hours in standby time. 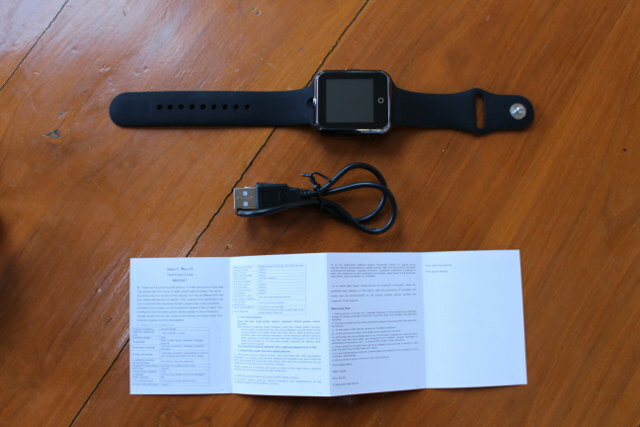 The watch ships with a short USB cable, and a user’s manual in English and Chinese. It is compatible with Android 4.3 or above. Features include Bluetooth notifications, call & SMS Reminder, body thermometer, pedometer, heart rate monitor, sleep monitor, local and remote camera, time display, sedentary reminder, phonebook sync, Bluetooth dialing, hand-free calls, UV Monitor, Anti-Lost, and more.. I received the package via DHL, and one advantage of the cheap price is that there’s no custom duty to pay. 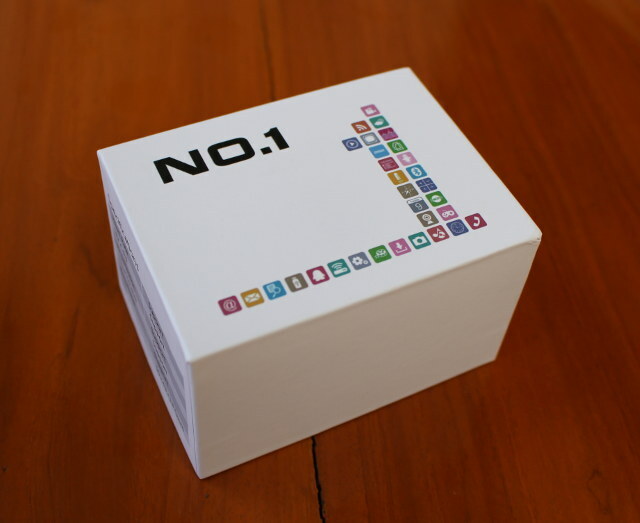 That’s the retail package with some of the key features on the side. 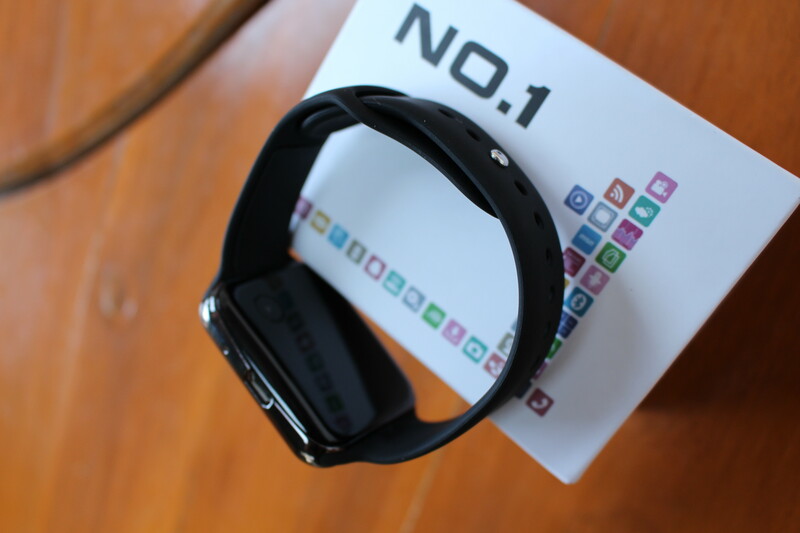 The watch comes with a micro USB to USB cable charging, and a simple user’s manual in both English and Chinese with parts of the specifications differing slightly from the specs on Tinydeal. The wristband is made of some very flexible rubber, and I believe it should last longer than some other plastic bands I used in the past. You’ll have notice the heart rate monitor sensor on the back of the watch above. The only interfaces are one button on one side, and a micro USB port on the other. You can find the camera on the top of the watch, which makes it easy to take horizontal pictures while looking at the watch. 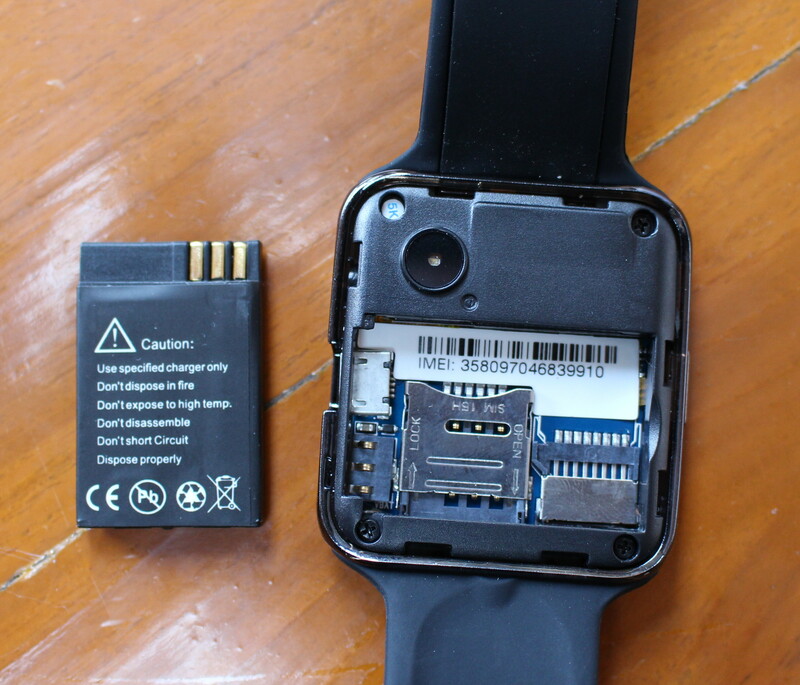 This teardown is a little different from others, as most of the time end users don’t really need to care about it, but the first steps are useful if you want to replace the battery, or more importantly insert a micro SIM card or micro SD card inside the watch. The first step is to pop out the plastic back cover with your fingernails. 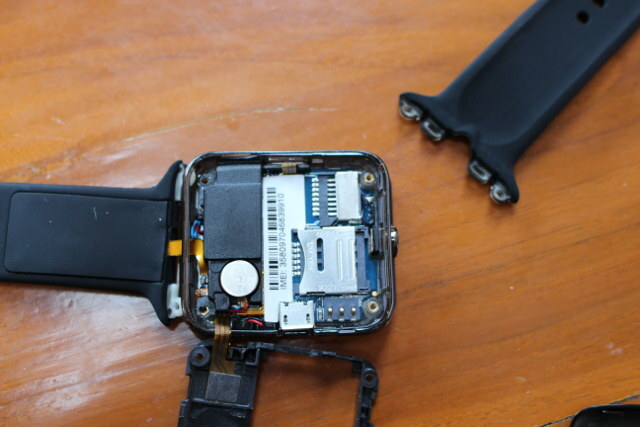 At this point it’s very clear the watch is not waterproof, except some drops of rain… The battery is not a 350 mAh LiPo as in the specs, but a 380mAh Li-Ion battery. You can press the bottom side of the battery to take it off. 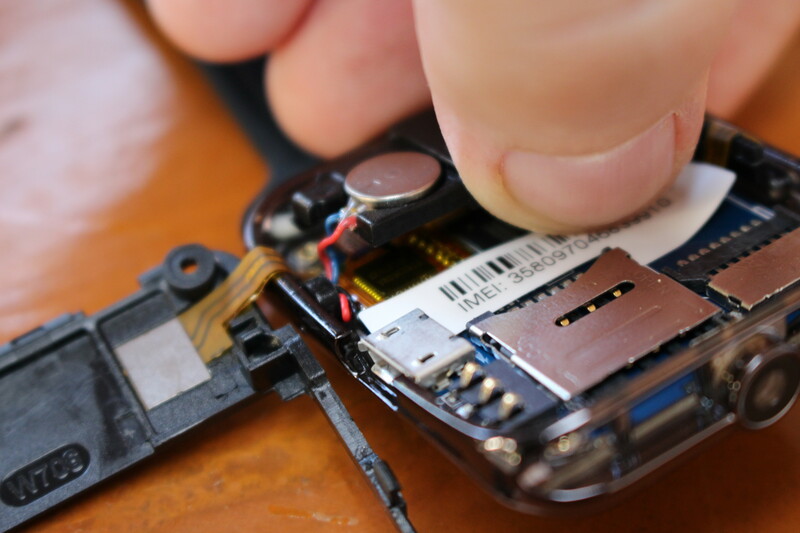 You’ll then find the IMEI number, a micro SIM slot in the center, and a micro SD slot on the right. Most people won’t need to open it further, and if you do you’ll lose the warranty after removing the four screws. This will loosen the wristband, and show a little more about the components. I did not want to take too many risks, since I still want to review the watch, and I only managed to peak at one component: FT6236GMA touchscreen IC. 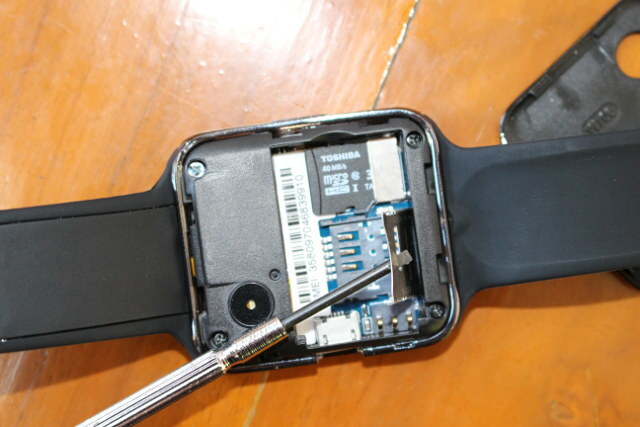 It should be possible to take out the HRM sensor, and check in my details. But for now I reassembled the watch, and inserted a 32GB micro SD card which was later on properly recognized by the system. Time to charge the watch, before playing a little more. The charge was very fast as in less than 15 minutes the watch was fully charged, but I’m not sure whether the battery already had some charge before. That’s something I’ll have to check out during the next few days. I’d like to thanks Tinydeal for providing a review sample. If you are interested, you could purchase from them for $22.99 including shipping, but the watch can also be bought from other e-retailers including GearBest, Aliexpress, Amazon US and others. Quite interesting. In your review could you (apart from battery life) also say a few words on the quality of the heart rate monitoring. (and can I readout the monitoring afterwards). I don’t have other devices to compare. So I’ll do some quick test like while lying down, and after a run. 1.Heart Rate – This only takes one measurement, and takes about 10 seconds. 2. ECG – Continuous measurement updated every 2 or 3 seconds. I could not find a way to sync with the app, so AFAIK the data is not backed up to your phone or the cloud. I haven’t spent much time on it though, so I might have missed how to do. Did you manage to get a copy of any GPL software on the device? I did not check about this. I think some people are already hacking on Mediatek MT626x wearables, so they will be more knowledgeable than I am, and they’ve commented once here. Just to state the obvious, those “MB” are Chinese MB, in reality, they’re Mbit. No GPL stuff here unfortunately. Not that the Chinese care about the GPL anyway but in this case there isn’t any. It boots from a custom bootloader to a RTOS based on Nucleus so everything is “nice” and closed source. along with some discussion about porting Fernly to this MT6261. It’s very similar to the MT6260 but it’s not quite the same. 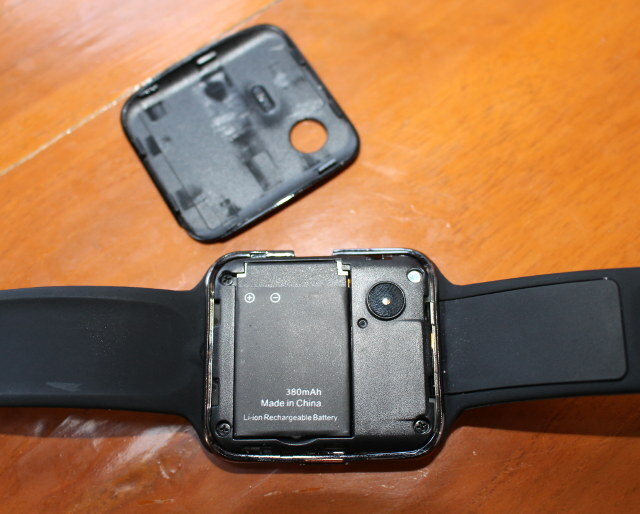 Hello , this watch is compatible with android and ios ? Also do you have Greek languange support ? Thanks. Android only, no Greek. The supported languages are in the specs above. 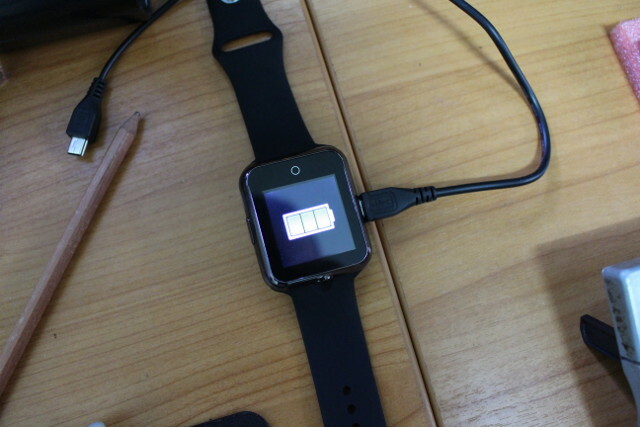 Do you know the android version that run in smartwatch? The watch is not running Android.